Western Colorado is becoming noticed for more than the Colorado National Monument and dinosaur fossils. There is good wine being produced here and visitors are coming to partake in it. When they need a place to stay, it’s hard to beat the quality and location of the Wine Country Inn in Palisade. This eighty room hotel offers guests just about anything they would need to enjoy their visit to Palisade, Colorado and points beyond. Surrounded by over twenty acres of vineyards and situated at the base of the magical Book Cliffs, guests are in the midst of Western Colorado’s best. Dining options at the Colorado Wine Country Inn are many, starting with your free breakfast served in the Tapestry Lounge. Fuel up on delights from the yogurt bar with house-made granola as a base. Muffins, fruit, oatmeal, cereals, bagels and pastries are also available. A wine reception is held daily in the afternoon near the lobby. The Tapestry Lounge serves lunch daily from 11 am to 2 pm and dinner from 5 to 9 pm. An onsite restaurant (Caroline’s), is open for dinner Thursday through Sunday 5 to 9 pm. Bicycle tours can be arranged with Rapid Creek Cycles in Palisade. After a day of bicycling around the vineyards under the warm Colorado sun, soothe your aching muscles in the outdoor pool and hot tub, open seasonally. Rent the entire pool area for a memorable family or business get-together. Catering is available for your event, if needed. Choose from a standard guest room, suite, ADA room, or Vintner’s Guest House with a fully equipped kitchen. All rooms feature microwave, refrigerator, coffee makers and more to provide most of what you will need during your stay. Some of the guest rooms come with a private patio to soak up the warm Colorado sunshine in peace and quiet. Antique photographs create a homey atmosphere, while plush bedding insures restful nights. The price is reasonable too, with rooms starting at just 164 USD for two adults and includes free breakfast, WiFi and wine reception. Wine touring is getting very popular in the Grand Valley. The wine quality just keeps getting better, to the point where Costco (a large warehouse-type grocery and home goods chain) has started selling some of the wines from the area! A recent survey for Grand Junction Visitor and Convention Bureau shows that 37.34% of visitors came to Grand Junction and Mesa County for winery tasting and tours. Beer and mead might also interest wine themed visitors to the area. The Meadery of the Rockies makes this ancient liquor from golden Colorado honey and can educate you on its delights in their tasting room. Kannah Creek Brewing Company, Rockslide Brew Pub and Edgewater Brewery offer beer lovers a taste of Western Colorado high-desert suds and a full menu for lunch and dinner. With the Tapestry Lounge onsite you will be able to taste most of the local wines and beers in the comfort of your hotel. After all, you wouldn’t want to get a DUI from the local police force! 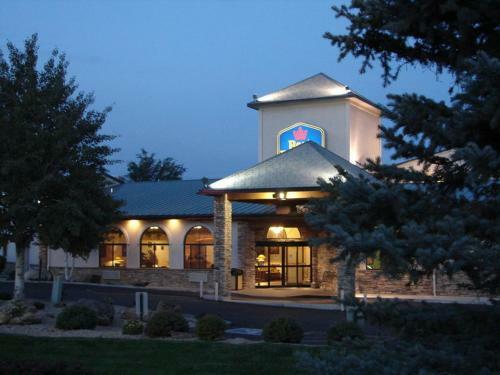 The central location of Colorado Wine Country Inn puts you in easy reach of the Grand Mesa, a great place to explore winter or summer. If you have an all-wheel drive vehicle, high-clearance vehicle (pickup truck), or mountain bike drive up the breath-taking Land’s End Road and get a big view of the Grand Valley from a place up high where the majestic Golden Eagles soar. Wandering the extensive high-country forests full of wildlife in the Grand Mesa is an outdoor enthusiast’s delight. While summer is the most popular time to visit, winter holds secrets high up on the Grand Mesa that attracts a crowd also. Snowmobilers flock to the immense public lands under deep mountain snows to play for hours on end in this winter playground. Cross-country skiers are fond of this high plateau also. The Grand Valley is the fruit basket of Colorado. In the summer and fall, taste the goods from roadside stands selling famous Grand Valley peaches, sweet cherries, succulent pears and crisp apples. For geology buffs, the Colorado National Monument entrance is less than thirty minutes away by car. If you plan on visiting the Colorado National Monument, be sure and see the Dinosaur Museum in Fruita as well as Dinosaur Hill, where a 1.5 mile or 2.4 kilometer trail takes you around this well-known quarry where paleontologist Elmer Riggs discovered two thirds of a seventy foot Apatosaurus. With so many outdoor activities it is easy to see why Grand Junction and Mesa County’s visitor numbers are growing. In the summer, enjoy white water rafting, mountain biking, hiking, fishing, golf and more. In the winter, there is skiing, snowboarding, snowmobiling and snowshoeing close by. Both winter or summer enthusiasts would do well to choose the Colorado Wine Country Inn for its location and comfort at the base of the stunning Grand Mesa and close to the Colorado River. No matter which season you choose, you now have the perfect location to base your Mesa Country trip from. Come see why visitor numbers are up and enjoy this fine hotel and its surroundings soon.